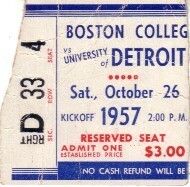 Original ticket stub from the Oct. 26, 1957 Boston College at Detroit college football game won by BC 20-16 en route to a 7-2 season. HAS HEAVY CREASES AND WEAR. ONLY ONE AVAILABLE FOR SALE.